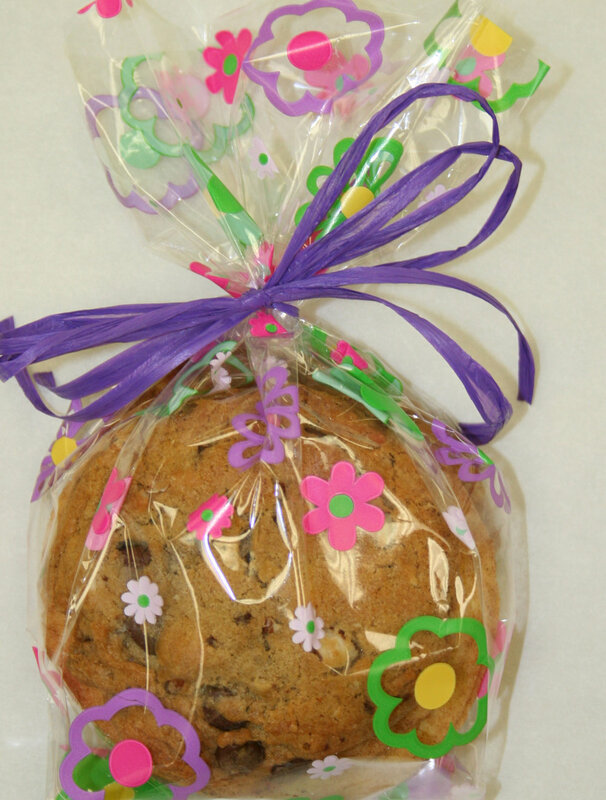 We can gift up to a little as 1 cookie in a cellophane bag, to dozens of them in a crate. Here's a list of the most popular gifts our customers love. This cello bag can contain up to 3 gourmet cookies. We typically tie a matching ribbon onto the bag to close it. Your choice of 6 cookies stacked and wrapped in cellophane to form a nice desktop gift. Various wraps are available for any theme you may need. 1 and 2 dozen glossy white bakery boxes are available for wrapping in cellophane and ribbon. A great gift idea when you need to get cookies to a small office, or a classroom. This cute clear gift box fits 1-1/2 Dozen or 2-Dozen gourmet cookies. This makes a great sweetheart gift, or any gift that comes straight from the heart. Gift cards are available for those with complex taste requirements, or if your just in a rush. Let them come in and get their favorite gourmet cookies. You choose the amount, and we provide the gift card and envelope.